For over a century, urban planners and visionaries have developed planned neighborhoods as remedies for problems caused by unregulated urbanization. Today, neighborhood planning has broadened its traditional focus on place-making and quality of life to incorporate many key ideas that are grouped under the rubric of sustainable development. Developing sustainable neighborhoods can be regarded as an important step towards solving some of the major global environmental change issues. This is because the neighborhood level is large enough to investigate and influence various socioeconomic and environmental forces that shape cities, yet small enough to coordinate bottom-up initiatives and implement plans. 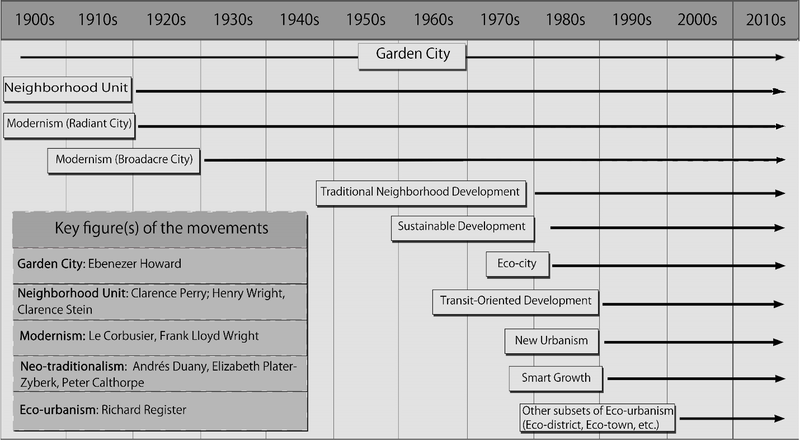 To determine how the underlying principles of neighborhood planning have transformed since the early 20th century and to what extent the movements have been successful in addressing a selected set of sustainability criteria, I conducted a literature review on five major planning movements: Garden City, Neighborhood Unit, Modernism, Neo-traditionalism and Eco-urbanism (see Figure 1). The differences among these five ways of creating desirable neighborhoods lie in their historical origins as well as approaches, goals and actions recommended. While a number of these ideas and characteristics have reoccurred in different movements, some others have emerged at the end of the 20th century following the rise of environmental and sustainability concerns. Since then, the underlying mechanisms that shape cities in general, and neighborhoods in particular, have undergone major transformations. 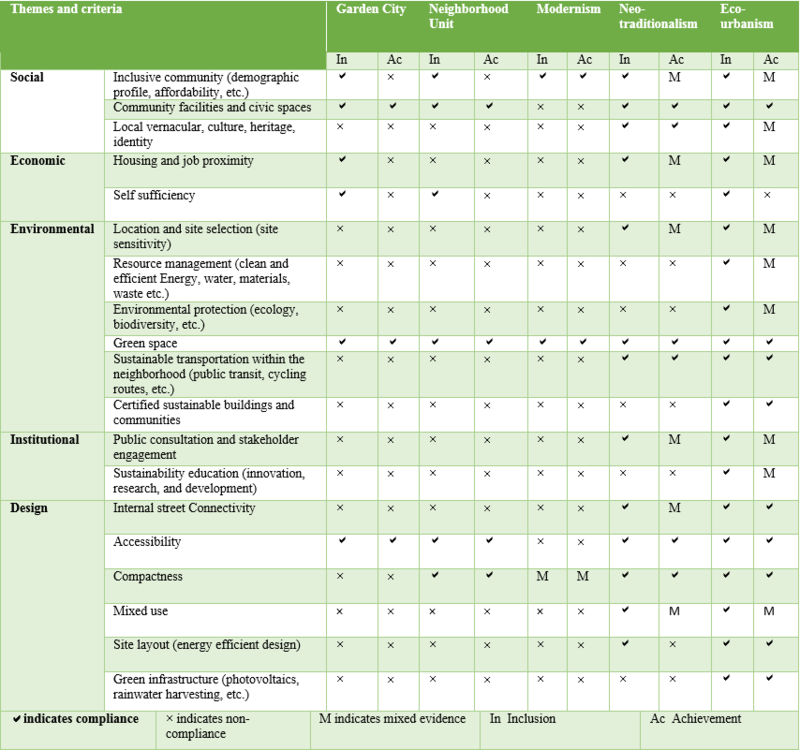 In order to examine whether sustainability concerns have been addressed across the selected movements, I first extracted several major criteria from the literature (Table 2). This is not meant to be a comprehensive list. However, I have tried to include main criteria mentioned in previous research (Meter, 1999; Sharifi and Murayama, 2013; Wheeler, 2013). Below, I briefly explain each movement. Basic information about the movements is provided in Table 1. Further information about the underlying principles of these movements can be found in Sharifi (2016). Table 2 provides overall information on how sustainability criteria have been addressed in each movement. Figure 1. The evolving agenda and key figures of the studied movements (Adapted from Sharifi, 2016). Garden City was proposed by Ebenezer Howard to address problems associated with overcrowded cities and find a way of combining the advantages of town and country living. What he proposed was a constellation of inter-connected, self-contained new towns, surrounded by a greenbelt and placed around a large main city. Each city was divided into six wards and designed to accommodate about 30,000 people. As can be seen from Table 2, self-sufficiency, provision of green space, housing-job proximity, and accessibility are among major criteria considered in Howard’s proposal. Inspired by Howard’s ideas, Clarence Perry proposed the Neighborhood Unit in 1923. His aim was to address social problems through enhancing physical design of the community. Each Neighborhood Unit was designed to accommodate up to 10,000 people. It was designed in a way that allows residents to walk no more than 400m to access civic facilities and commercial areas. 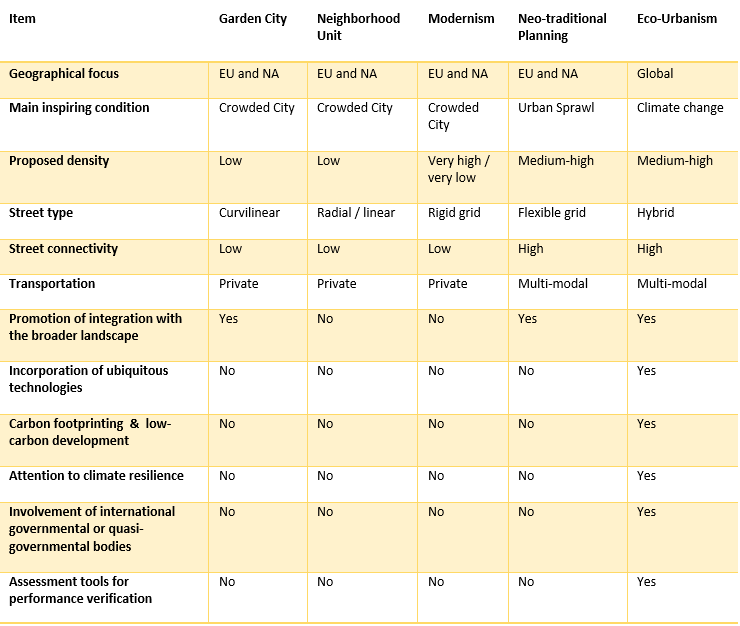 As Table 2 shows, this movement has also tried to address the same sustainability criteria mentioned for Garden City. The major difference is that the latter has put less emphasis on compactness and more on housing-job proximity. The Modernism movement emerged in the inter-war period of the 1920s and 1930s as an antithesis of the previous movements. Modernism was mainly instigated by technological advances in construction and transportation industries. It was seeking to bring about social reform through physical and technological changes. Inclusiveness and provision of open/green space were two major sustainability criteria considered by Modernism. Unlike the earlier movements, Modernism did not pay due attention to human-scale, with emphasis on superblocks and accessibility via modern, high-speed transportation. Figure 2. A scale model of Masdar city, an eco-urban development located in Abu Dhabi, UAE. Image Source: Author. Despite all previous efforts, cities and neighborhoods in the latter half of the 20th century still faced many difficulties such as sprawl, declining inner-city neighborhoods, poverty, pollution and community instability. As a reaction, Neo-traditional movements emerged to emulate traditional neighborhoods that were characterized by walkability, human scale, active centers and compactness. These movements have made some improvements through recognizing the significance of engaging residents in the planning process, enhancing the equitability of developments and modifying land use and transportation patterns to reduce the vehicle miles traveled. More attention has also been given to the impacts of climate change and rampant urbanization in some developing countries. Movements that fall under the general heading of Eco-urbanism have emerged in response to these specific concerns. Eco-urbanism builds on the previous movements by, among other things, taking advantage of ubiquitous green technologies, developing strategies for smart and efficient use of resources, promoting brownfield and infill development, focusing on carbon footprinting and low-carbon development, paying attention to climate resilience and verifying performance using assessment tools. These tools are used to examine the extent of incorporation of sustainability criteria into neighborhood plans. By doing so, planners hope to foster a sense of competition among developers. This competition can enhance the process by raising standards and fostering innovation. In the meantime, it can be viewed as a learning and educational opportunity that enhances the knowledge and awareness of different stakeholders involved in the process. Integrating assessment and monitoring into planning may also be an effective way of enhancing transparency of the process. A comparison between the early movements showed that in cases such as Modernism and Neighborhood Unit, new planning movements have dismissed the ideals of their predecessors. However, the new movements (Neo-traditionalism and Eco-urbanism) have avoided this mistake by capitalizing on potential complementary benefits gained from synergies between the past planning cultures. While examining the selected movements, I found that they had achieved limited success in realizing their initial goals. Building diverse and inclusive communities is an important goal that none of the movements have been able to accomplish satisfactorily. The reviewed literature indicated that planners should be aware of the risk of creating ‘islands of wealth’ that are not beneficial for their surrounding neighborhoods. A look at the genealogy of neighborhood planning in the 20th century revealed that neighborhood planning has been mainly practiced in the form of suburban development. A major point of difference between Eco-urbanism and other movements is that the former places a great amount of emphasis on protecting ‘greenfields’, controlling sprawl, and revitalizing inner urban areas. This can be regarded as a change of direction toward brownfield and incremental development. While Eco-urbanism as the most recent movement intends to contribute to solving problems associated with global environmental change, historical problems such as social equity have not yet been completely addressed. Several reasons for this gap between theory and practice of neighborhood planning have been mentioned in the reviewed literature. A recurrent criticism is the overreliance of planners on physical and technological determinism. Despite differences between neighborhood planning movements in terms of their origins, all movements have sought to revolutionize the status quo through physical design and focus on modifications in urban form. All have failed to acknowledge that the process of change is not easy to control. Planners and policymakers should be aware of the limits of physical and technological solutions to social problems and avoid subordinating social factors to physical and technological ones. The fact that Eco-urbanism uses the sustainability concept as a guiding framework provides an opportunity to avoid being caught up in the fallacy of physical and technological determinism. At its core, the concept of sustainability requires a paradigm shift from physical determinism to sustainability-based pluralism. Pluralism means not only proper consideration of the various dimensions of sustainability, but also providing a platform for various stakeholders to participate in the planning and decision-making process. To be in accordance with the sustainability concept, neighborhood planning should move away from being prescriptive, take into account the context-specificities of different locations, and acknowledge that different social, economic, environmental and technological factors are mutually reinforcing and should not be pursued in isolation. The influence of market forces was found to be another major reason for limited success of planning movements. Obtaining institutional support for plan implementation could be a strategy to address this issue. New Urbanism has garnered such support through HOPE VI and HOZ programs and its success story can be emulated by other neighborhood planning movements. It is hoped that planners and researchers will find further solutions for reducing the influence of market forces. Neighborhood planning is recognized as essential for achieving sustainable development. As Table 2 indicates, over time the scope of the guiding principles of the movements has broadened to include more sustainability criteria. Eco-urbanism as the most recent movement tries to integrate various sustainability principles into neighborhood development. It should be viewed by planners as a movement that can guide creation of sustainable and climate resilient neighborhoods. A major knowledge gap is that, while carbon discourse is an essential component of Eco-urban movements, the focus has been more on emissions in the operation phase rather than on life cycle emissions. Although an Eco-urban project may be low-carbon when completed, carbon emitted during the extraction, construction and demolition phases should also be taken into account. Future work needs to be carried out to investigate whether Eco-urban projects are still low-carbon when lifetime emissions are taken into account. Such a research may provide insights for further development of neighborhood planning movements. Here I have only investigated major planning visions (mainly in Europe and North America). Future work needs to be done to examine other movements that have not been discussed here and to investigate the evolution of neighborhood planning in other parts of the world. As empirical results presented in the reviewed literature were often based on a limited sample of neighborhoods, there is also a need for further examination of the empirical aspects of neighborhood development. Sharifi, A. (2016). From Garden City to Eco-urbanism: The quest for sustainable neighborhood development. Sustainable Cities and Society, 20, 1-16. Holden, M., Li, C., & Molina, A. (2015). The Emergence and Spread of Ecourban Neighbourhoods around the World. Sustainability, 7(9), 11418-11437. Sharifi, A., & Murayama, A. (2014). Neighborhood sustainability assessment in action: Cross-evaluation of three assessment systems and their cases from the US, the UK, and Japan. Building and Environment, 72, 243-258. Sharifi, A., & Murayama, A. (2015). Viability of using global standards for neighbourhood sustainability assessment: insights from a comparative case study. Journal of Environmental Planning and Management, 58(1), 1-23. Dr. Ayyoob Sharifi is Executive Director of the Global Carbon Project – Tsukuba International Office in Tsukuba, Japan.